We’d love your help. Let us know what’s wrong with this preview of A-Ma Alchemy of Love by Nataša Nuit Pantović. Spiritual Historical Novel. A-Ma is a historical spiritual novel set in the 17th century (Age of Enlightenment) Macao that follows lives and spiritual insights of settlers of this little peninsula in the middle of China. 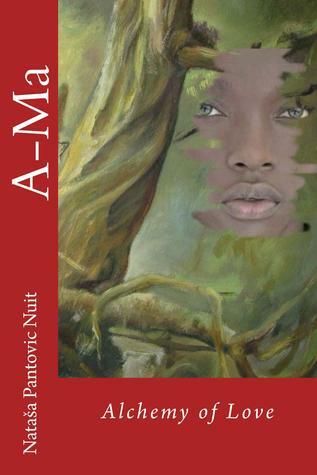 A-Ma main protagonist is Ama, an African alchemist, Goddess, a guru, a lover, a story-teller that inspires and gathers artists, preachers, priests, philos Spiritual Historical Novel. A-Ma is a historical spiritual novel set in the 17th century (Age of Enlightenment) Macao that follows lives and spiritual insights of settlers of this little peninsula in the middle of China. A-Ma main protagonist is Ama, an African alchemist, Goddess, a guru, a lover, a story-teller that inspires and gathers artists, preachers, priests, philosophers from all around the world within the magic settings of her coffee house. She believes in a spiritual truth that we all can live our highest potential, discovering the gold within. Traveling through space and time, we find ourselves in the midst of an amazing blend of Chinese, Portuguese and Africans that live together on this little peninsula. This magic place, that is rapidly growing as a centre of trade offers a pot for the highest alchemy practice ever, the alchemy of humanity, creating an energy matrix that will change the lives of generations to come. We are transferred into the time of strong religious clashes and dogmas, and the scientific revolution, where our protagonists join the fight of the enlightened minds of the time, such as Giordano Bruno and Da-Vinci for the establishment of the New World. Through Ruben, a Portuguese Jesuit Priest who came to China to convert the Chinese into Christians, and through Ama and her family, friends, followers and enemies, we enter into the insights and challenges of the time they lived in, we join their attempts to learn from both the Eastern and Western philosophy, and we witness their personal inner transformation. In China some prominent historical events shaped the future of Western and Eastern philosophical thought and civilization. All the events and manuscripts mentioned within the book: the Dutch attack to Macao 24th of June 1622, the Reform of the Chinese Calendar during 1630s, Father Schall’s Appointment to the Chinese Board of Mathematicians (during 1650s), Witches Hunt, and Witches Manual, etc, are carefully researched historical facts. The book uses history to create the connection between actions of the individuals that live surrounded by magic. A-Ma takes us on an exploration journey discovering the secrets of the bond we all have created during the millions of life-times on Earth, the bond of consciousness and suffering. Will Ruben manage to break this bond and enter into the world of alchemical transformation discovering his own divine potential? Will love that guides him, transform him, will his friend, guru and lover, Ama manage to break the matrix of habits, thoughts and patterns that surrounds them? Will Ama’s friends manage to reach enlightenment, will human society manage to shred the veil of dogmas that encircles it, or will the forces of Dark Ages be stronger or will Ama be prosecuted as a witch? To ask other readers questions about A-Ma Alchemy of Love, please sign up. Historical Fantasy, Historical Fiction, Historical Mystery set during the Age of Enlightenment. A novel about China, eastern philosophy, enlightenment, love, magic, Gods, Ama, Portuguese priests, the settlers of Macau (Macao) during the 16th and the 17th century. Deep profound reading. Fallowing a very interesting story set in the 16th century of Alchemy, magic, Chinese I Jing. The dance of Yin and Yang, rational and intuitive is very obvious within the chapters of the book. A female dreamy approach to life versus a male, an energetic and scientific approach. Ama lives during the scientific revolution of Age of Reason, during the time when missionaries tried to convert Chinese to Christianity finding a rich, advanced, intriguing culture, and philosophica Deep profound reading. Fallowing a very interesting story set in the 16th century of Alchemy, magic, Chinese I Jing. The dance of Yin and Yang, rational and intuitive is very obvious within the chapters of the book. A female dreamy approach to life versus a male, an energetic and scientific approach. Ama lives during the scientific revolution of Age of Reason, during the time when missionaries tried to convert Chinese to Christianity finding a rich, advanced, intriguing culture, and philosophical approach to Life and God that is amazingly different from our Western one. Ama. Who is Ama? I asked when I saw her eyes for the first time looking at me from the cover of the book. She intrigued me instantly. I know Nuit and her work, from the moment of her first exhibition launch of Art of 4 Elements poetry and art bbook in 2012, when a group of artist exhibited 120 works (photos, painting, pastels) inspired by Nuit!s 120 poems of elements, and I was looking forward to hold this beautiful book /novel in my hands. I know that Nuit was writing Ama for more than 10 years Ama. Who is Ama? I asked when I saw her eyes for the first time looking at me from the cover of the book. She intrigued me instantly. I know Nuit and her work, from the moment of her first exhibition launch of Art of 4 Elements poetry and art bbook in 2012, when a group of artist exhibited 120 works (photos, painting, pastels) inspired by Nuit!s 120 poems of elements, and I was looking forward to hold this beautiful book /novel in my hands. I know that Nuit was writing Ama for more than 10 years and I was aware of some of her writing anecdotes. Ama had a life and personality of her-own and the most amazing one. For example, Ama as a protagonist of the story, was black before Nuit has decided to adopt her two kids from Ethiopia. Her deep connection to the African story and wisdom is completely fascinating. At one point I remember Nuit recalling, she has decided to remove Ama!s love-life from the book. After she did all the edits, she forgot about this little crazy episode. She did not touch the book for a while and when returning to it she mistakenly returned to the previous, un-edited version of the story, the one with Ama!s love-life intact. Nuit said that Ama did not want her to do anything so stupid as to remove such an important part of the story. This book transferred me into a journey to another sphere, time, through foreign lands, mix of cultures, perhaps even through different spiritual dimensions, still touching upon questions we all ask even today. Is it religion, or magic or heart we ought to follow? Love that is in its pure simplicity the essence of the path to highest spirituality, through the deep respect of life elements: water, fire, wood, metal and ea Ama as a virginal youth, or fully blooming female, or as a Goddess herself. Beautiful read. I enjoyed the story, the history elements of it and more than everything, the style of writing. It is one of those books which leave me inspired; when I'm not reading I find myself thinking of it and when I finish reading, I find my thoughts referring back to it - for many days..